I’m aiming to write a review once a month or so and they will just outline a few topics that i think might be interesting or relevant regarding my race training. The key thing is outlining the difference between self training and having a one-to-one coach. Ill also give some insight into training techniques and specific sessions – without giving any of Sean from Infinity Peak Performance’s secrets away! My weekly input into training has risen very slightly but I’m still putting in below 7hrs per week. This has been adapted slightly from cramming whatever i could into the weekend to scattering across the week. 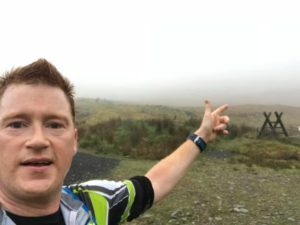 This is better from a loading and recovery point of view and frees up my weekend a little bit, but doesn’t mean the occasional late night run – I’m having to slot training sessions in wherever possible. So if you see a red faced middle aged man wearing Amphibia reflective clothing – gillet & scarf – out running at 10.30pm at night then it could be me! If this is what has to be done occasionally then i’m happy to do it and it means i’m not eating into family time. Even simple sessions have become relevant. Every session, even recovery ones have something to keep an eye on, whether it’s pace or heart-rate etc. It keeps things interesting and keeps you focused on the end goal. Every week i cycle to and from work a couple of times, its fairly mundane but is a solid 45minute session every time. Now commutes are a lot more interesting as im either pushing it more on the flats and holding back on the hills or peppering the ride with short sprints. Im sure many passing drivers wonder what i’m at, peddling the bike like i stole her! To be honest i didn’t think having a coach would make much of a difference in terms of intensity… well it has! Perhaps it’s just the fact that everything i am doing is being recorded but more specifically it’s the fact that everything i’m doing is being monitored by my coach. A bit like the effect of taking part in a race or being watched by people i think you will naturally push yourself a little bit harder. I’ve pretty much always trained on my own, that’s not to say i don’t like training with others, just with a hectic schedule it’s easier to adhere to your own timeline. Therefore I’m well used to pushing myself with nobody else around and would have said being with a group or coach wouldn’t make much difference but it does! Knowing that Sean is going to be looking at results later is always in the back of my mind and knowing that he has spent time planning the schedule for me means i want to hit the targets he has set me. When on my own schedule I’m a bit more likely to go easier due to not being 100% or having a few drinks the night before etc. I was guilty of just clocking in training hours a lot of the time, grabbing a half hour run here or an hours cycle there. That has its place when you are time stretched, but with Infinity Peak Performance every session has a purpose, whether it be pushing boundaries, increasing speed or active recovery. It actually saves a bit of effort on my part planning so i can focus on expending energy during the sessions. The hardest part for me is learning the session beforehand and on several occasions I’ve had to bring my phone with me to remind me of the various different stages. I’m sure this will improve as i learn the different terminology and my zones. I was due to compete in a local half marathon but due to a work commitment i wasn’t able to attend. I had planned to complete my own marathon distance race the next day as a substitute, but Sean advised that i instead run 4 x 5km heats with 1km in between for recovery. This would allow me to test myself over the appropriate distance with fatiguing the body too much. I chose a canal tow path route to keep it as flat as possible. The first 5km was tough, raising the pace to the required level of 5.20 per km. The second one started tough but half way through i got into a pattern and started to enjoy the run. On the turn and the third one was really good, it may have been a slight wind behind or a caffeine gel! Then on the fourth heat i struggled but managed to maintain the pace as 5.12 per km. I felt a slight strain on my hamstring which meant i wasn’t able to lift the pace further towards the end but it didnt seem serious at the time. Since then i haven’t been able to run more than a jog and it has meant my target of Belfast Marathon wont be happening, this year at least! I have to listen to my body and its not fit for a marathon at the moment. At least all of the run training goes in the bank and i can focus on cycling and swimming until my first triathlon of the year in early June. This is the perfect example of how i had slipped into comfort zones with my training. My turbo trainer had become nothing more than an easy pedal for an hour or so in the evening watching TV. Whilst undoubtedly better than sitting on the coach, i would struggle to reach 100BPM (heart beats per minute) whereas whilst cycling outdoors i would expect to be easily 120BPM raising to 150BPM with little perceived effort and 170 on uphills. Now when i have zones and different efforts to cover across the timeline it keeps you focused. It also vastly increases the amount of sweat produced, progressing from a wet t-shirt to a wet towel and floor! Things haven’t been all plain sailing as could be expected returning to serious training after a couple of easy years. I’ve had an ongoing tight calf issue which manifests itself as a sore ankle but can be eased out with stretching. During my fastest run i did feel a slight strain on my hamstring which i didn’t feel again until a few days later during another run, much worse this time. Giving appropriate feedback to Sean we were able to restructure the week with some easy cycles whilst i booked in with a physio to start dealing with the issue. Again having a flexible schedule is important and not feeling pressured to do sessions. I touched on my basic goals for the season in my previous blog, the main one being a sub 3 marathon. I then got thinking about my PB’s for various distances and categories, most of which i didn’t know! As a matter of interest i had a look back at race results over the past few years and pulled together some PB’s. As I’ve never actually done a 5km or 10km race I’ve taken these times from triathlon splits. As you can see my best years were 2 or 3 years ago, largely due to a reduction in training and focus. It will be interesting to see how i can compare to these previous times with a few years added, a lot more miles in the tank but being aided with smart coaching and science! I’d recommend if you don’t know your PB’s have a look back at your race times. It gives you something to aim for and you might even be pleasantly surprised at some of the results you have achieved previously!